"I love the blend of herbes de Provence, honey, lemon, and lavender. The acidity of the lemon perfectly balances the sweetness of the honey. This dish is always a hit and all five of my children cheer when I place this on the table. I use an Instant Pot®, but this recipe can be easily adapted to be baked in the oven instead. I hope you enjoy it as much as my family does." 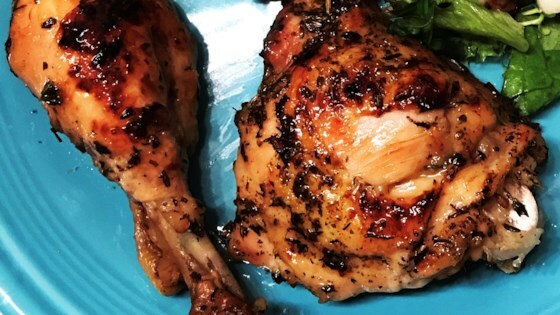 Rub the herbes de Provence into the chicken legs and thighs. Turn on a multi-functional pressure cooker (such as Instant Pot(R)) and select the Saute function. Add 2 tablespoons olive oil and sliced garlic. Add chicken legs and thighs to the pot and brown on both sides, 5 to 7 minutes. Remove chicken from pot and set aside. Add chicken stock to the pot and place a rack inside. Return chicken to the pot, on top of the rack. Close and lock the lid; choose high pressure and set the timer for 25 minutes. Allow 10 to 15 minutes for pressure to build. While chicken is cooking, prepare the sauce. Whisk honey, lemon zest, lemon juice, thyme leaves, remaining oil, and lavender flowers together in a small bowl. Set an oven rack about 6 inches from the heat source and preheat the oven's broiler. Line a baking sheet with aluminum foil. Release pressure carefully using the quick-release method according to manufacturer's instructions, about 5 minutes. Unlock and remove the lid. Transfer chicken to the prepared baking sheet. Brush sauce liberally over the chicken; reserve remaining sauce. Broil chicken in the preheated oven until browned, about 2 minutes, watching carefully to prevent burning. Pour remaining sauce into a small saucepan over medium-high heat. Add one ladleful of liquid from the pressure cooker. Whisk in cornstarch and boil until reduced by half or thickened to your preference, stirring frequently to prevent burning, 1 to 3 minutes. Serve sauce alongside chicken. Bright, citrusy, herbed and comforting chicken dinner. if you do not have a rack, you can use aluminum foil. It is also possible to just place the chicken in the liquid, but the skin will probably be even soggier (the one downfall of Instant Pot® cooking). If you want the get even more flavor, run the lavender through a coffee grinder real quick; it helps to release more floral flavor. A little bit of work to get things timed out with the other dishes (not my strong suit), but it was really good. Wife liked it, but she also liked that she didn't have to cook.